S.L. 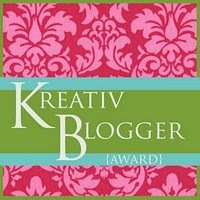 Hennessy over at Pensuasion has awarded me with a Kreativ Blogger Award! I'm so tickled. The parameters are I have to spill 7 interesting facts about me. Which is kinda hard cuz I don't find myself that interesting. 1) My stupid human trick is I can suction cup to floor. It's a side effect of flat feet. 3) For minoring in film, I know nothing about celebrities. 4) When I was younger, my dream house would have each room be themed. One for lava lamps, one for books, one for horses, one for dragons. 5) I'm a mean baker, and like to twist recipes so they may turn out not so mean. My friends still hassle me about those brownies I sprinkled with lime jello powder. 7) I'm a huge Transformers fan. I used to watch the original cartoons, and my fangirlness had continued to the Michael Bay movies (though I'm more in awe of the special effects than the plot lines). I have...four action figures from the series and kinda want to do a comic strip about them. Maybe someday. I know I'm supposed to pass this one to more amazing people, but 1) you guys are all amazing and I can't pick and choose like that and 2) my compy in dying and I want to publish something. I absolutely love the idea of the themed house, specifically your themes. It sounds wonderful!